It appears Congress has suddenly woken up to champion the cause of the Dalits, who were ignored by most mainstream political parties including the Congress, for the last three decades. Perhaps the last time the Congress showed genuine concern for the plight of the Dalits was when Indira Gandhi, as opposition leader crossed a flooded river riding an elephant to visit a Bihar village, Belchi, where dozens of Dalits were butchered by upper caste persons. Almost every day Dalits at some or other places are subjected to brutal atrocities but seldom political leaders visit them and fight for justice to them. Before Rahul Gandhi's departure for Mhow, Congress party president Sonia Gandhi wrote to Prime Minister Narendra Modi, urging him to table the SC/ST Prevention of Atrocities (Amendment) Bill in Parliament in the monsoon session. Ms. Gandhi pointed out that the previous UPA government had promulgated an Ordinance shortly before demitting office last year in order to strengthen the implementation of the original Act. 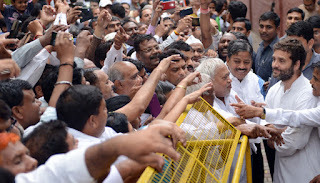 Rahul Gandhi, while addressing a massive rally at Mhow on June 2, launched the Congress’s year-long 125th birth anniversary celebrations of Dr. Babasaheb Ambedkar from his birthplace. He said Ambedkar’s dream of “caste annihilation” was yet to be fulfilled. Citing recent incidents like the alleged murder of a man for using an Ambedkar song as ringtone, the banning of an IIT-Madras study circle for allegedly raising caste issues and a company allegedly refusing to hire an MBA graduate because he was Muslim, indicate only that some people are still denied social equality. So, is this campaign inspired by opportunism or concern for the Dalits.